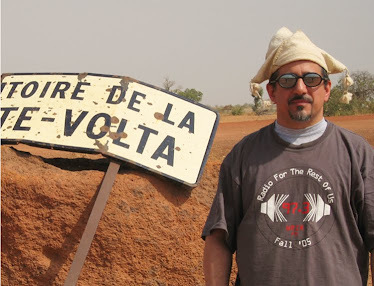 WRIR really is the radio station that thinks globally and acts locally. You hear global news on programs like Democracy Now!, Talk Of The Nation and Free Speech Radio News funded by donations from local listeners and underwriters right here in Richmond. 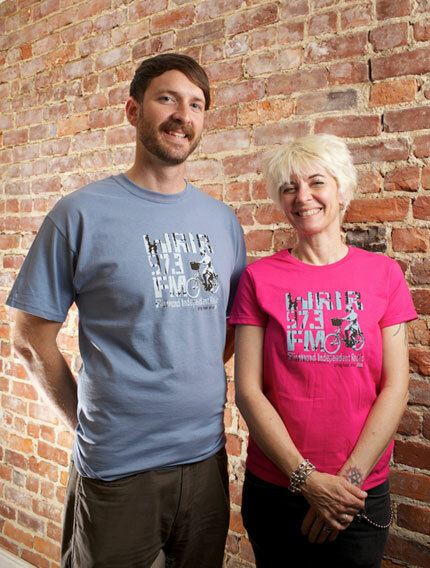 Local volunteer music hosts (like the two pictured above, modeling the Spring '11 T-shirt design) play music of all genres from around the globe. Everybody gets in on the global action here at WRIR. For example, Greta Brinkman (right in picture), WRIR's Loud Music director, will play host to a live performance by Iraqi metal band Acrassicauda (made famous in the film Heavy Metal In Baghdad) Friday at 9 PM. And Mike Rutz (left), WRIR board member and Local Music director, plays artists from around the world who stop off to perform in Richmond on his program Activate! Plus he currently bears more than a passing resemblance to Gogol Bordello's Eugene Hutz. We're coming into the final weekend of WRIR's Spring '11 Fund Drive, so let's start it with a big bang of generous donations to keep independent, unembedded, uncorrupted community radio in Richmond going and growing. I have a few special premium packages of some of my favorite new releases -- two for the first $100 donors during Global A Go-Go and one mega-package that will go to the person who donates the most money during the program. Just click "Read More" for the details.